OK I grew up when PF was at his peak....let me ask you a question.....would anyone have heard of him if he didn't record "Do you feel like we do?" & put out the live version of it that you hear on the radio? Frampton was awesome with Humble Pie before the "Frampton Comes Alive" stuff which got old. Does not get enough credit for his work with Humble Pie. Actually saw him at the Grand Ole Opry a couple of years ago. Ricky Skaggs was playing and said that he would like to bring out a special guest. Out came Frampton. I really like Frampton, but I think your bar might be a bit low. Mmmmh, he was the flavour of the year in the UK when Steve Marriott left the Small Faces. Marriott wanted him in the SF, the others balked. Frampton ended up in Humble Pie (with Marriott). Frampton's also a childhood friend and schoolmate (NOT classmates) of David Bowie (Frampton's father was an art teacher and possibly music teacher at said school, and the family befriended Bowie). Skipped many a class at L.S.U. to hang out and discover new music there. They had an unbelievable Import Section. Peter Frampton is properly rated. I don't need no doctor! 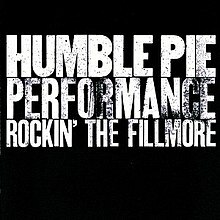 One of the alltime great live albums. He was once described as having an average voice and a passable guitar style. I think that's about right. Bob Heil is a very interesting guy, I have talked to him quite a few times. Even though he made major contributions to the technology of producing rock music such as the first large scale concert sound systems, his personal musical taste is in the genre of "Theater Organ " which he started playing as a teenager, and still performs and records on.